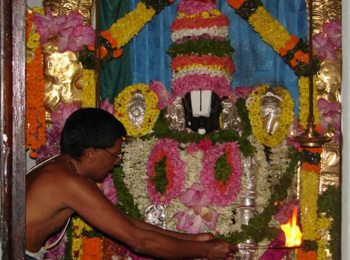 Poolangi Seva is a ritual in which the Moola Virat of Tirumala Tirupati Devastanam temple, is dressed in a rich velvety attire, covering the Moola Virat from head to toe; garlands made of flowers are then put on the deity. Every Thursday post the Tiruppavadai Seva the Poolangi Seva is performed. It is an ancient ritual and a reference to the ritual is even made in the Tamil classic, Silappadikaram, in sometime around 756 AD.